It’s a day to monkey around… c’mon get up and get into some monkey business! Once, a long time ago, lived a troop of monkeys and their king, Kapi. They lived in the branches of a mango tree near the Ganga river. Kapi, the monkey king was afraid that once humans tasted the delicious mangos his tribe would be in danger. So he only had one rule, no mango must fall into the Ganga river where it might float downstream to the human village. One day a mean and unhappy monkey named Korung saw a mango fall into the river but he did not retrieve it. This mango floated downstream where it was caught in a fisherman’s net. The fisherman took the sweet smelling fruit to his king. The next day, the king took a search party up the river to find the tree. Once they found it, the men began picking up mangos to take home to their kingdom. The monkey king, Kapi, saw all this and knew the day he had dreaded had come. He woke his tribe to alert them of danger. Seeing and hearing the monkeys in the tree, the humans began shooting arrows at them. Kapi knew he must do something to save his tribe. He choose the longest vine he could find and tying it around himself he jumped across the river to a rose apple tree. The vine was just a bit too short and so Kapi had to become a part of the bridge to lead his tribe to safety. 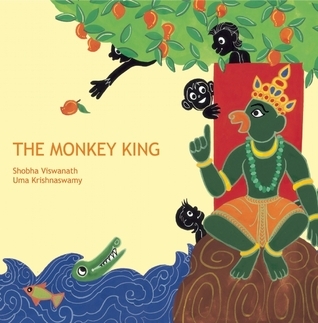 The monkeys crossed gingerly over their king, all except Korung, who stomped on the king’s back causing him to fall into the river. The human king saw what Kapi had done for his tribe, and ordered his men to fish him out of the water and revive him. He then proclaimed that the location of the mango tree would remain a secret so the no one would ever return and harm the monkeys. Kapi and the king returned to their own homes and ruled their kingdoms well for a very long time. The monkey sees the bananas on an island in the water. He puts his toe in the water and decides to wade across, but then he sees a shark and jumps back on land. Monkey has another idea to cross the water… stilts, but he hits a huge hole and falls under coming face to face with the shark. Monkey jumps out of the water and returns to his beach. Then Monkey uses a huge piece of meat as bait for the shark. The shark takes the bait and the monkey! Monkey has to use his fishing pole to hold the shark’s jaws open so he can escape. Finally, Monkey ties vines together to make a lasso. He throws the lasso across the water and snags the banana tree bending it down toward him. 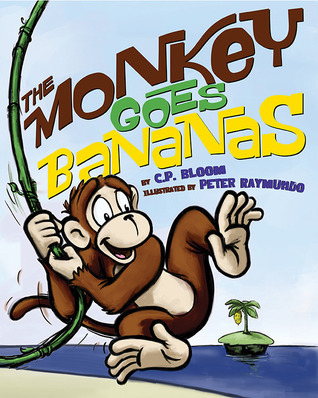 Unfortunately, the vine snaps back dropping the bunch of bananas on the beach and swinging Monkey back to the island with only one banana in his hand and his leg caught in the tree. Hanging upside down over the water, Monkey spies the shark again. Determined to eat his banana, Monkey peels the skin off the banana and just as he’s about to take a big bite the banana slips out of its peel and falls into the open mouth of the shark. Monkey is left hanging upside down in the tree with no bananas. This little girl and her toy monkey act like zoo animals. 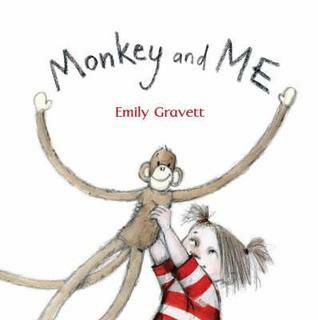 The refrain, ‘monkey and me, monkey and me, monkey and me, we went to see…’ leads the reader to the next page to see which animal they saw next. But before you turn the page, the reader can look at the illustrations of how the little girl acts to guess which animal they went to see next. The story ends with the monkey and the girl falling asleep.